For scuba divers, fins become an extension of our bodies, essential for effortless and natural navigation of the underwater world. We don't always realize this as we are swimming, but the second they are taken off, the phantom limb becomes apparent and swimming becomes a daunting task. There are hundreds of different models of fins, each with their own specificities, designs, and colors! However, it's not always easy to choose the perfect fins. The purpose of this article is to present all these different models and their defining characteristics so you can determine which fins are right for you and guarantee the best and most comfortable dives possible in the future. There are multiple models of fins, so to simplify their identification they can be sorted in categories according to their major characteristics. There are two big categories of fins. The first main category is the bootless fins. As the name suggests, these fins are characterized by a “shoe like” shape, which encompasses the foot without need for neoprene boots. These fins are common and recommended for warm waters, due to lack of protection against the cold. In Quebec, it is discouraged to wear them given the water temperature… The second main category are the strap fins. These are characterized by a large foot opening which uses a rubber or steel strap to fasten the foot in place. This model has multiple advantages, such as quick and easy fastening and de-fastening of the strap, as well as the opportunity to wear neoprene or dry suit boots. Boots are often regarded as cold water items, only practical for warmth, but that isn't their only use. Indeed, boots are particularly comfortable and prevent friction between the skin and fins. The rough anti-slip sole of the boot is extremely useful during boat or shore dives, as they protect the foot against rough or slippery terrain. Furthermore, they are easy to put on and take off, sliding on the foot easily when submerged in water. There exists two types of straps: adjustable straps or spring-type straps, both are practical and easy to use and only differ in attachment. The adjustable straps have a buckle to attach to, while the steel straps simply have to be slipped on and off. Therefore these are the two main categories of fins. Apart from the two major distinguishing factors, strap fins or bootless fins, fins have a number of important characteristics that need to be taken into consideration such as length, flexibility, materials… A longer fin means a bigger volume of water moved per kick, therefore a greater propulsion, or more effortless swimming. This characteristic is usually sought out in fins as it enables efficiency in swimming and a better control in complicated situations such as strong currents. A good example of this type of fins are the Phazer d’Aqua Lung which is conceived for optimal propulsion. Another good example, which is a compromise between length and flexibility, are the Apeks RK3, which are conceived for high accuracy and strong propulsion all the while shorter in length enabling easy transport. Another important characteristic to consider is the flexibility of the fins. Flexibility in fins needs to be proportional to the strength of the diver: a more muscular diver will swim inefficiently with too flexible fins as they will bend too much to move water, while a less muscular diver needs this flexibility to accentuate their kicks and strengthen their propulsion. 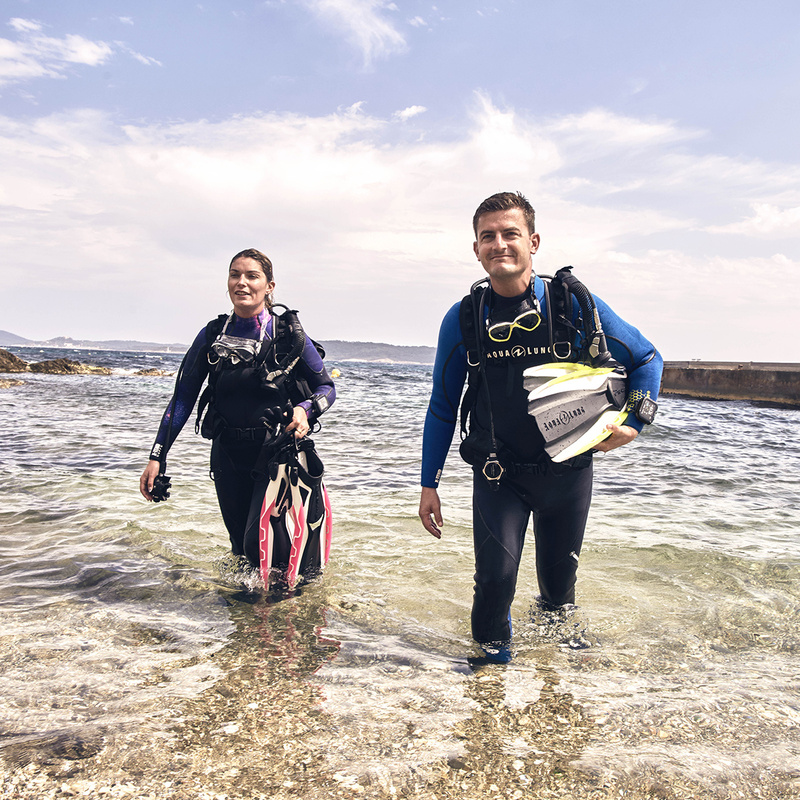 Fins with a flexibility not adapted to the diver can lead to cramps and fatigue during dives which is why it is important to have personal equipment adapted to your needs. This is especially important for fins, but also masks and snorkels. These pieces of equipment are used regularly in every dive, and can last many years. The different materials used influence the life span of the fins, but mainly they are made of plastic and rubber, which are strong and long-lasting materials. Different types of plastic are often used in a single pair of fins, such as the Phazer fins, which have more rigid borders and a more flexible center for optimal propulsion. Otherwise, most fins use a single plastic to maximize flexibility and propulsion, such as the Express ADJ fins. There are of course exceptions to the plastic use, such as the RK3 fins that are made entirely of rubber, making them indestructible, with a good propulsion and enough flexibility to be comfortable during long dives. The fins described above are essential fins used for scuba diving. For other activities such as snorkeling or skin diving, shorter fins suffice and provide enough propulsion for surface swimming or short underwater dives the length of a held-in breath. For free-diving however, specifically adapted fins are essential to enjoy the experience. 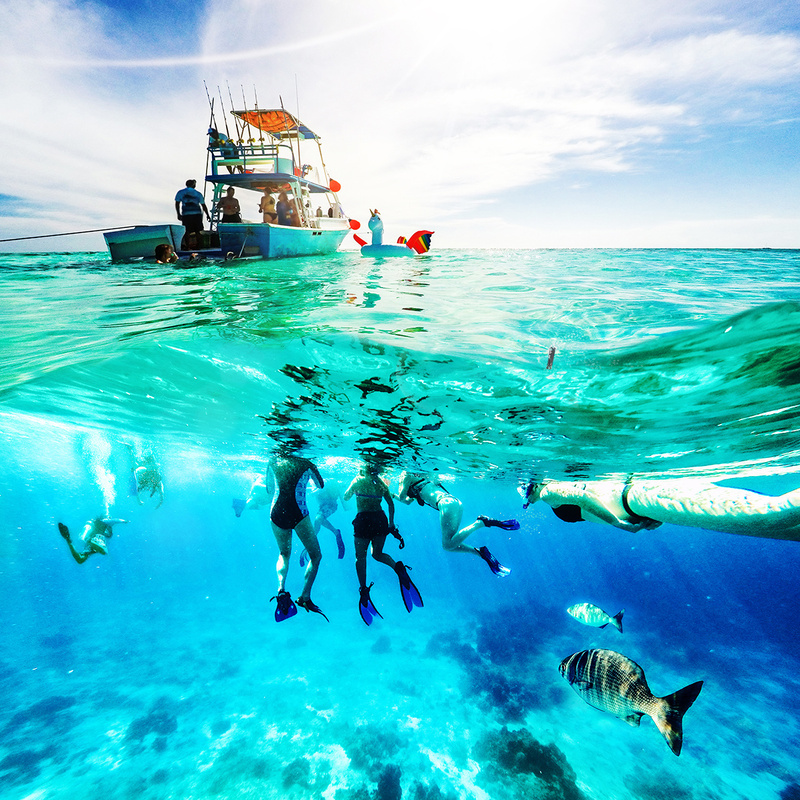 Unlike scuba diving, there is no list of required equipment, but charastically long and thin fins are used for maximum propulsion and speed. This enables the diver to dive deep and cover great distances in one breath. The flexibility characteristics of fins are similar to those in scuba diving. However, freediving fins also have models made of glass and carbon fibers for better reactivity to the diver’s movements. The physical functioning of the fin follows a simple lever mechanism with a contact surface principle: the more water the fincan move, the better the propulsion and the faster the diver. Most of the freediving fins are bootless fins to accentuate energy transmission. Some apnea divers also use monofins, which strongly resembles the caudal fins of marine mammals such as dolphins or whales. Fins are a central and essential element of scuba diving, without them, diving would be impossible as we would not be able to travel significant distances, and our streamline posture would be thrown off as fins act as a stabilizing agent. 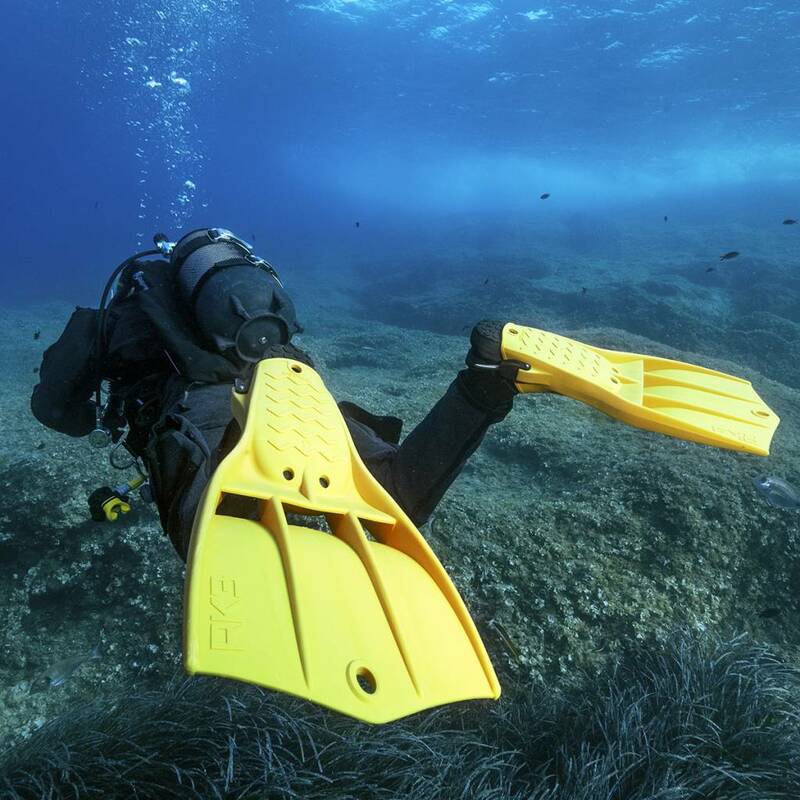 This is why it is extremely important to choose a pair of fins adapted to your own personal needs and capabilities, to guarantee effortless, enjoyable diving every single time you go underwater.